A kiteboarding paradise with long, wide, uncrowded sandy beaches, clear blue waters and glorious sunshine. 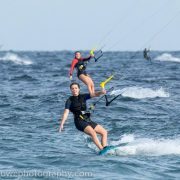 Conditions at Vela Baja are perfect for all types of kiting. For launching and landing there is a wide, sandy and uncrowded beach that stretches for several miles in both directions. The wind usually fills in around mid-morning and blows until late afternoon. Winds vary from a steady breeze to very strong with a typical windy day ranging 18 to 23 knots. The side-shore winds from the left ensure there is ample space for all kiters. When a strong “El Norte” blows, sizeable swell can build giving great conditions for kitesurf style riders. Your safety is our primary concern and we provide a constant safety watch and rescue service for our kiting customers. 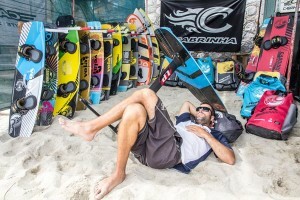 You can rent from our wide range Cabrinha kiteboarding equipment. No matter the wind conditions, your level or preferred riding style there is equipment to suit your needs. You’ll find an extensive range of twin-tip and kite surf boards as well as the latest hydrofoils. The majority of kites are current year models with sizes from 5m to 14m. Rentals start from as little as half a day with prices discounted for longer periods. Your safety is our primary concern so we ask all renters to take a brief pre-rental assessment course. Alternatively you may present your valid IKO level 3 card as evidence of kiting competency. Up to 3 kites inflated. Interested in learning or improving? Then consider taking one of our lesson programs. There are courses for complete beginners as well as more advanced riders wishing to progress. To ensure your maximum progress (and safety) we generally adopt an effective “one-on-one” approach to kite lessons. Furthermore, although each course has an outline structure, you’ll find our instructors tailor each and every lesson to fit your exact needs. 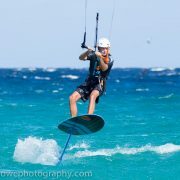 Please also note that kiteboarding lessons will typically include some theory, as well as on-water time. Lessons packages start at 2hrs and are discounted for longer courses. Designed for beginners with no previous kiteboarding experience. 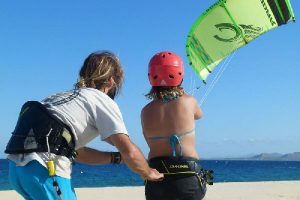 The purpose of this “one-one-one” course is to bring the student to IKO level 2 certification which signifies not just basic riding ability but true SAFE INDEPENDENCE as a kiteboarder. This equips the student with sufficient knowledge to continue practicing alone via renting or purchasing their own kiteboarding equipment. As above but with two students sharing one instructor. This “one-on-one” course is designed for students that have part completed a basic course and require some additional hours of instruction to attain the IKO level 2 standard of SAFE INDEPENDENCE. Already proficient riders may also use this course to develop more advanced skills and techniques to take their riding to the next level. 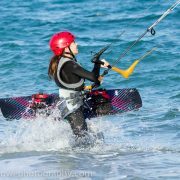 This “one-on-one” course provides all the basic knowledge – with a focus on safety – for proficient kiters wishing to try hydrofoil kite boarding. 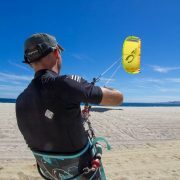 A mandatory requirement for ALL kiteboarding equipment renters unable to demonstrate kiteboarding proficiency via a valid IKO level 3 certificate. 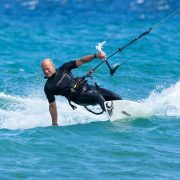 Our qualified kiteboard instructors will assess basic knowledge and determine if the customer is suitably knowledgeable for SAFE INDEPENDENT kiting. Proficient kiters unfamiliar with our Cabrinha equipment may also elect to take this course in which our instructors will run through basic safety systems and location specific factors.